Acknowledged author Russell Pearce wrote Professional Responsibility: A Contemporary Approach (Interactive Casebook Series) comprising 961 pages back in 2017. Textbook and etextbook are published under ISBN 1634600169 and 9781634600163. 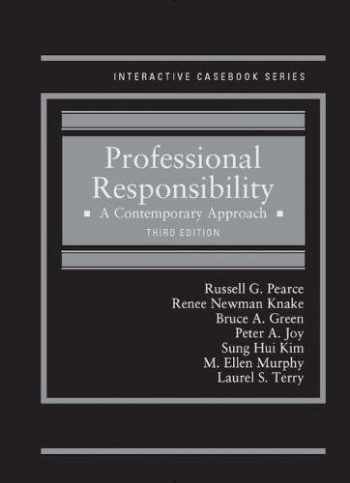 Since then Professional Responsibility: A Contemporary Approach (Interactive Casebook Series) textbook received total rating of 4 stars and was available to sell back to BooksRun online for the top buyback price of $89.28 or rent at the marketplace. As a part of our CasebookPlus offering, you'll receive a new print book along with lifetime digital access to the downloadable eBook. In addition, you'll receive 12-month online access to the Learning Library which includes quizzes tied specifically to your book, an outline starter and three leading study aids in that subject and the Gilbert® Law Dictionary. The included study aids are Acing Professional Responsibility, Exam Pro on Professional Responsibility, Objective and Legal Ethics in a Nutshell. In Print and Online, Professional Responsibility: A Contemporary Approach offers a comprehensive, challenging, and engaging treatment of the law and ethics of lawyers’ work, including professionalism, in a modern and accessible format. Faculty have the option of using the casebook as an innovative paper text or as the foundation for a computer interactive pedagogy that features thought-provoking online components, including internet links and multiple choice assessment problems on CasebookPlus™ to satisfy ABA formative assessment requirements. Each chapter features learning outcomes, and most chapters include audio-links to mini-lectures by the authors to explain difficult concepts.